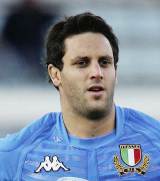 Italy flanker Josh Sole was born in Hamilton, New Zealand of Italian parents. He moved to Italy to play for Viadana in 2004, and was called up into the Italian national squad only a year later. He made his international bow against Argentina in 2005 and subsequently played two games during Italy's 2007 World Cup campaign, starting against Romania and Scotland. Sole played a full part in Italy's 2008 Six Nations campaign, playing in all five of Italy's tournament matches. He was then retained by Italy boss Nick Mallett for Italy's summer tour and autumn internationals, playing all five of Italy's fixtures. His most recent move took him back to Italy with Aironi in 2010 ahead of their debut season in the Magners League.